A pie iron is an extremely versatile tool to use for cooking over an open fire. You can use a pie iron to make breakfast, lunch, dinner and dessert. Meal options using a pie iron are endless. With a little creativity, you can make just about anything with a pie iron. Check out the eight pie iron recipes that we have shared, you’ll definitely a couple you will want to try. The most important thing to remember is to butter your bread well…especially the side that will be placed against the inside of the pie iron or spray the inside of your pie iron well with non-stick cooking spray. A word of caution: do not spray your pie iron near the open fire or spray the non-stick cooking spray towards the open fire, the can might explode and the non-stick cooking stream could catch fire. Camping and camp fires go together like bread and butter or beer and pretzels. 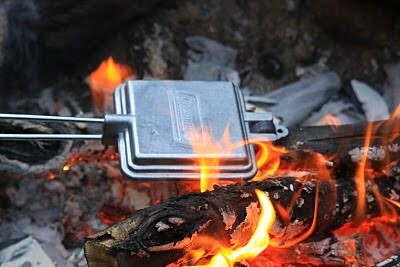 Here in the north woods outdoor cooking, camping, campfires and a pie iron go together. We like our s’mores but we are equally found of our pudgy pies too. Making pudgy pies using a pie iron is fun, easy, versatile and a delicious way to make meals outdoors. Your kids will love these “pies” and they’ll have fun helping you make them and eat them too. Here are a few of my families favorite pie iron recipes. These 8 pie iron recipes make great campfire cooking treats and meals. In a large bowl whisk all ingredients together. Spray pie irons (4) well with non-stick cooking spray. Dip 8 slices of thick Texas toast bread into egg batter. Place dipped bread slices into prepared pie irons. Add a thin layer of maple syrup on one slice of bread and 1 or 2 tablespoons canned apple pie filling on other slice. Close pie iron and cook over a fire until golden brown. Serve with additional maple syrup and sprinkle with powdered sugar if desired. Spray (4) pie irons with non-stick cooking spray. Line pie irons with bread, spread one slice of bread with mustard. Layer cheese and ham slices on bread, close pie irons and cook over a fire until golden brown. In a large bowl whisk together all batter ingredients. Spray pie irons (4) with non-stick cooking spray. Dip bread into egg batter and place into prepared pie irons. Spread jam or jelly on bread slices. Layer with ham, roasted turkey breast and cheese. 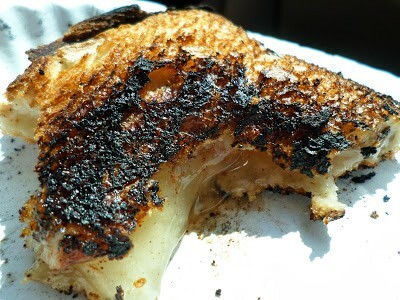 Close pie irons and cook over a fire until golden brown. Lay bread slices in prepared pie irons, top with pizza sauce and toppings of your choice. 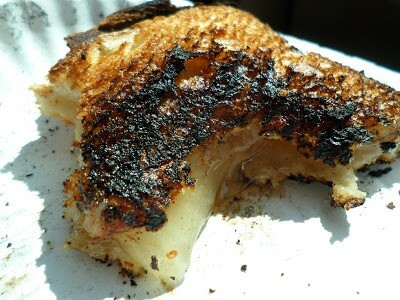 Close pie iron, cook over a fire until golden brown. Serve with additional pizza sauce. Spray 4 pie irons with non-stick cooking spray. Lay bread slices in prepared pie irons. Spread a few tablespoons of apple or cherry pie filling on bread sprinkle with ground cinnamon, omit for cherry, drizzle with maple syrup, omit for cherry. Spread bread slices with peanut butter. Lay banana slices on one slice of bread. Top banana’s with mini chocolate chips. Sprinkle one slice of bread with crushed graham crackers. Toast 2 marshmallow over fire, place toasted marshmallows on graham crackers. Spread the other slice of bread with Hershey’s spreads. Did You Know? Wondering which apples are best for baking? The best baking apples are slightly tart. Some top choices are Granny Smith, Braeburn, Cortland, Northern Spy and Rome Beauty. Pie Irons sound like a fun thing to do when gone camping !